After watching the Super Bowl on Sunday, fans of The Masked Singer think they've uncovered a major clue about the identity of whoever has been wearing the Bee costume over the past few weeks: could it be Gladys Knight?! Admittedly, the "Empress of Soul" has been our guess for who the Bee is pretty much since her first performance on the show, given how much the Bee's voice sounds exactly like Knight's. Not only that, but the clues seemed to be a dead giveaway for Knight, too: the Bee says she's had a "long career" and never wanted to stop doing what she loves; she says the nickname "Empress" suits her; and she wants to sing for "a whole new generation," since she first started singing "in the '50s." 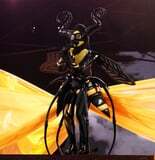 What truly sealed the deal was Knight's soulful performance of the national anthem at the Super Bowl this year, which convinced many fans of The Masked Singer - even those who previously thought the Bee might be Tina Turner - that Knight is indeed behind the wacky black and yellow costume. But, since we're still waiting to see who it will truly be, feel free to compare one of the Bee's most recent performances on the reality competition show with Knight's rendition of the national anthem ahead.